1. Why are you renovating the library? As a much loved and much used building that has been in use for almost 25 years, Morrison needs updated building systems including electrical, HVAC, mechanical, fire protection and telecommunications. At the same time, the renovation provides a chance to rethink the building spaces based on community feedback and 21st century practices. We are grateful for Mecklenburg County for approval of the funding in 2014. 2. Will the library be closed during the renovation? For how long? Yes, the current schedule calls for the building to be closed starting July 30. 3. What will be done in the renovation? The renovation will bring Morrison from 24,108 SF to 26,711 SF for a total square footage increase of 2,603. This will include major service delivery and technology improvements, including a new/expanded children’s area and dedicated program space, expanded community rooms, group study spaces, quiet study rooms, enhanced computing areas, a self-service café, a creative maker-space, a teen area, a family restroom, outdoor spaces and a drive-through book drop. 4. 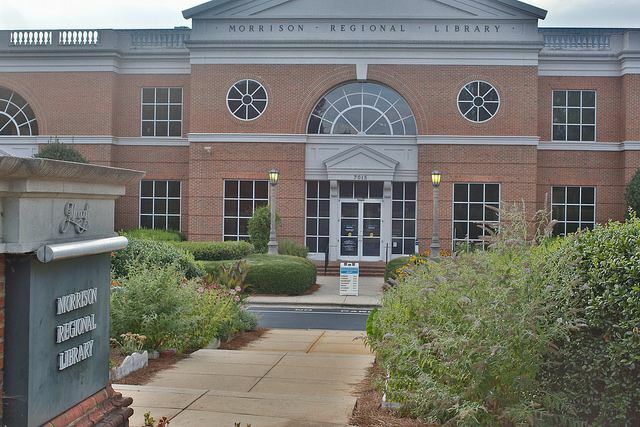 How will library service be impacted for Morrison users during the renovation? Accessing Materials: Although the Library will be closed during the renovation, books and materials will continue to be available 24/7 online via cmlibrary.org. Customers will be given options on how best to manage holds well in advance of the closure; options will include the ability to select an alternate holds location most convenient to the customer before July 15. If no choice is made, the default location for holds pickup will become South County Regional (5801 Rea Road Charlotte, NC 28277), just over 5 miles away. Storytimes: Storytimes will continue at nearby community locations. Two storytimes for ages 0-5 years old will be held each Monday and Wednesday morning at Carmel Presbyterian Church (2048 Carmel Rd, Charlotte, NC 28226) and on Tuesday and Thursday mornings at Sharon Presbyterian Church (5201 Sharon Road Charlotte, NC 28210). Other storytimes are offered at various times at our 19 other library locations at cmlibrary.org. We are currently planning for several other services to be provided at community locations. 5. What is the cost of renovation and what is the source of the funds? The total funding allocated for the renovation is $8,017,000, from Mecklenburg County/Pay-Go Funds. 6. Why will the branch be closed during the construction? Morrison will undergo a major renovation of the entire building, including systems and public and staff spaces. We understand that a closure of 12-18 months will be a major inconvenience to our users, and we apologize for the inconvenience. We believe that the safety, noise and cost issues avoided by closing the branch in its entirety during the renovation will far outweigh the potential disturbance. We believe you will agree that the final result will be well worth the temporary discomfort. • Safety Reasons: Leaving Morrison open or “phasing in” the work during the construction would likely pose a safety hazard for construction workers, library employees, and for our visitors. These dangers include, but are not limited to electrical hazards, ADA/accessibility issues caused by working on the entryways during construction, air pollution caused by contaminants present in the air during construction and other dangers. Further, the construction requires disabling the building’s sprinkler systems and County buildings cannot be occupied without proper fire prevention. • Noise Levels: Environmental noise due to construction activity would prohibit most library activities such as storytimes and workshops/events. • Cost Increases: Having the ability to completely close during the construction enables the cost of the renovation to remain within the approved funding parameters. Phased in work would likely extend the timeline significantly and require night and/or off-hours construction which would raise costs beyond the budget provided. 7. I have further questions about the renovation. Who can I contact?